Produced by Judd Apatow and directed by John Lee from a screenplay by Paul Reubens and Paul Rust, the Netflix original movie Pee-Wee’s Big Holiday sees the fun-loving Pee-Wee Herman (Reubens) have a fateful meeting with a mysterious and charismatic stranger (Joe Manganiello) who inspires him to take his first-ever holiday in an epic story of friendship and destiny. 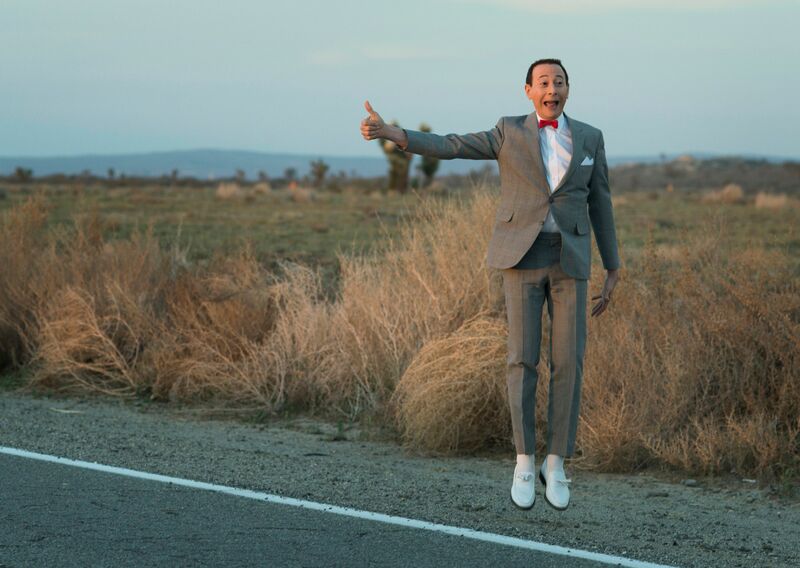 More than three decades after bursting onto the scene, Pee-Wee and his delightful adventures can now be enjoyed by a new audience of kids while those who have loved him all these years are reminded of why they originally fell in love with him. During this exclusive phone interview with Collider, actor Paul Reubens talked about how much he enjoyed his collaboration with Judd Apatow and Paul Rust, why John Lee was the right director to helm this project, what initially drew him to Tim Burton for Pee-Wee’s Big Adventure, his love for Joe Manganiello, why Pee-Wee never changes too much, and always finding new ways to appreciate the character. He also talked about playing Penguin’s father on Gotham and how fantastic he thinks Robin Lord Taylor is, as well as how much he’s learned from working with Steven Soderbergh on Mosaic for HBO, and why it’s a good time to be Paul Reubens. Collider: Could you ever have possibly imagined, when you started playing this character, that you’d be playing him long enough that a whole new generation would be exposed to him now? PAUL REUBENS: That would be impossible. Part of me wishes that I could say yes to that, but no, I didn’t have any idea. 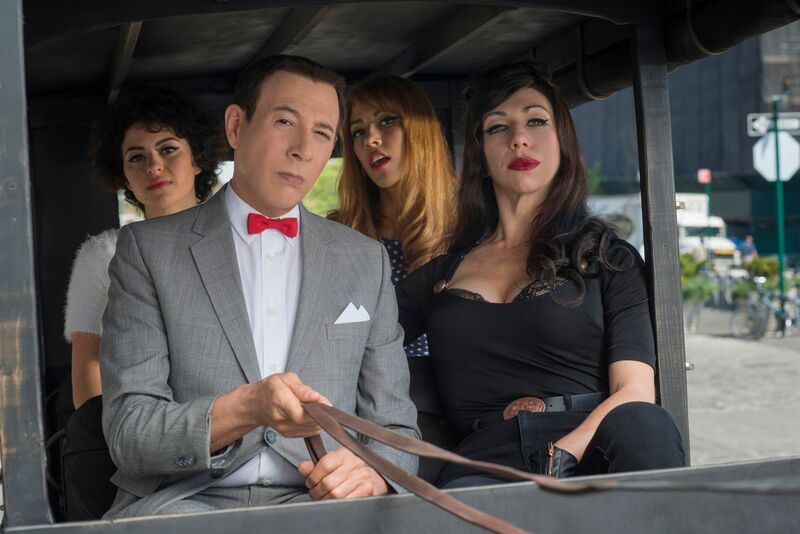 Clearly, people have connected to Pee-Wee Herman, which is great because it introduces him to a new audience and it brings him back to those of us who feel a sense of nostalgia for him. REUBENS: Judd [Apatow] has talked about that a little bit, also. He did an interview where he said, “I gave Pee-Wee fans something they never thought they’d see – another Pee-Wee movie.” It’s a funny way to put it, but he gets emotional about it, and I like that. There was a lot of talk about bringing Pee-Wee Herman back, over the years. From when you and Judd Apatow started working on this movie five years ago, how much evolution of the story was there? REUBENS: I don’t think it evolved that much, to be honest. The script we had five years ago was about the same, in lots of ways. Only smaller details changed. Obviously, Tim Burton understood the childlike wonderment of Pee-Wee Herman in a way that not many other directors might have been able to understand. As the guy responsible for launching his career as a director, when you brought him in to direct Pee-Wee’s Big Adventure, what did you see in him? REUBENS: I think it was the wallpaper in Frankenweenie, in the second shot of the movie. From the first minute of his film, I could tell that he was somebody who was very interested in style. He brought style to something, and a lot of young directors aren’t there yet. A lot of people who have directed for long careers still don’t have much style. So, I could tell that he had a style, and that he understood production design and art direction. There was a lot of stuff about that first film that felt perfect to me. And I was young and new, so I didn’t realize how crazy it was to hire Tim Burton, at the time. And ultimately, in hindsight, it wasn’t crazy, at all. Now you can take credit for being the genius who hired Tim Burton first. REUBENS: Well, even more current, I can take claim on (Pee-Wee’s Big Holiday director) John Lee’s career. I think it’s the same thing. I think he’s a rock star, and he’s not 26. He’s a grown up. Was there something in John Lee that you similarly saw, that let you to know that you’d be on the same page for the film? REUBENS: In really different ways. There were different factors, but they all added up to the same thing. And I’m not shy about that. I’m just not scared about that. To me, a first-time director brings a lot to the table, like stupidity. They don’t know anything yet. They don’t know what they’re getting themselves into. Everybody involved with this seems to come from a somewhat different background in comedy, but there’s still such a love for it. So, how were Paul Rust and Judd Apatow to collaborate with? REUBENS: You’re so right about that. Judd and I could not be more different, and yet we have definite common ground and goals. And I just love Paul Rust so much. We’ve become best friends, over five or six years. The dynamic between you and Joe Manganiello is so great to watch. 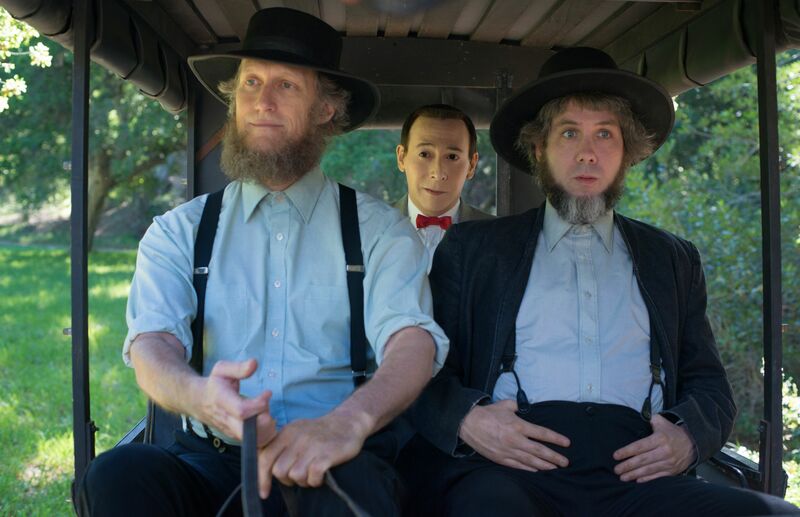 What did you enjoy about working with him, and what do you think it is that makes Pee-Wee so intrigued by him? 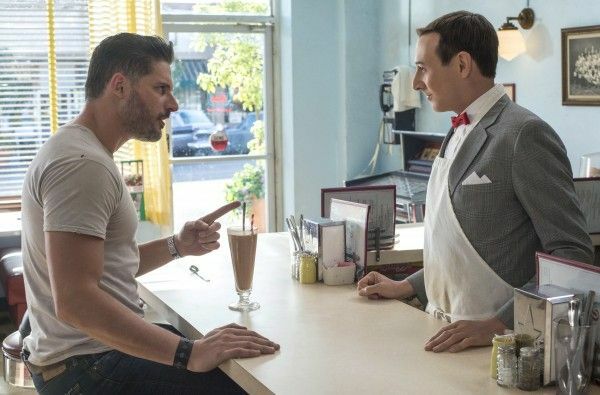 It’s fun to get to see Pee-Wee out in the world and interacting with so many different types of people that he wouldn’t necessarily come across in his small town. After having gotten out in the world, who do you think Pee-Wee is, now that he’s worldly? REUBENS: I don’t know. I think Pee-Wee doesn’t change that much. 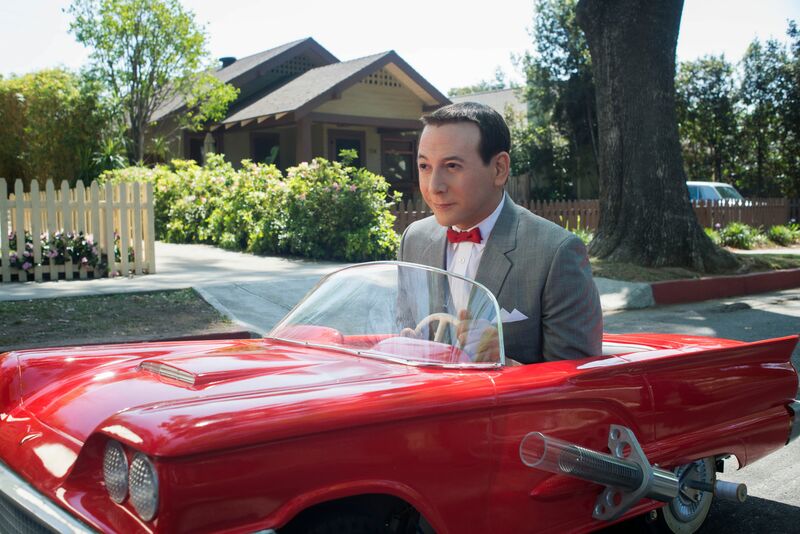 I don’t think that whole adventure is unaffecting to Pee-Wee, but I think Pee-Wee resets, all the time. I feel like, at the end of the day, he’s back in his town and not much has changed. A little bit has changed, but it’s a little bit like Dorothy, at the end of The Wizard of Oz. I don’t know. I’m not sure of the answer to that. Do you find new ways to appreciate Pee-Wee Herman, when you play him? REUBENS: Yeah, absolutely! I’m not sure how I do it, but yeah, absolutely. I think it’s the same as being on stage, as a plain old actor, trying to figure out how to make it fresh, every night. And if you take a 15 or 20 year break in between, it becomes fresh again. You were great in your debut episode as Penguin’s father in Gotham, and it’s exciting to watch you and Robin Lord Taylor working together. Initially, your character seems like a pretty serious guy who genuinely wants to get to know the son he didn’t know he had, but when we meet his family, it seems like something else might be going on there. As we learn more about your character and what he’s about, will we see that there are many more layers under the surface there? REUBENS: I can’t answer that. I’ll get in trouble. I cannot comment. What’s it like to work with Robin Lord Taylor and develop that dynamic between the two of you? REUBENS: I’m having this weird thing happen to me now, and this is a great problem to have, where I find myself on a set where my co-star is like, “Oh, my god, I can’t believe I’m working with you!” It was a little bit like that working with Joe, and Robin was a little bit like that, also. I don’t know. It’s just odd and funny to be in that situation. It’s a great problem. I’m not complaining. It’s just odd. But, Robin is so great. I’ve been so lucky to work with the people I’ve been working with lately. Robin is fantastic. I love Joe, and I love Robin, too. I’ve made some great new friendships that I think are long-lasting, and it’s super exciting. This is a great time to be me, right now. You’re also doing Mosaic with Steven Soderbergh for HBO, and I know it’s super top secret and you can’t talk about what it’s about, but what made you want to work with him? Are you a fan of his work and his style of filmmaking? REUBENS: Oh, yeah, absolutely! And I’ve learned so much already, just in a few weeks. It’s incredible! Pee-Wee’s Big Holiday is available at Netflix.